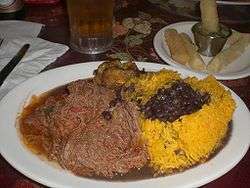 Authentic Cuban dish of ropa vieja (shredded flank steak in a tomato sauce base), black beans, yellow rice, plantains and fried yuca with beer. Frijoles negros (literally "black beans" in Spanish) is a nutritious dish made with black beans, prepared in Cuba, Venezuela, Puerto Rico, Mexico, and other nations in Latin America. The black bean, a legume of the species Phaseolus vulgaris, are usually purchased in either canned or dried form. 1 cup of dried black beans yields approximately 2½ cups of cooked beans. 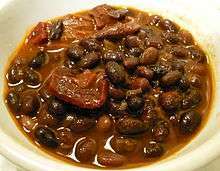 Black bean soup (sopa de frijoles negros) is another commonly prepared Cuban favorite. 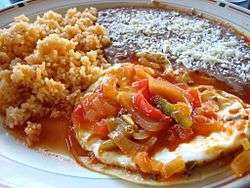 Frijoles negros is typically seasoned with salt, ham hocks, onions and garlic, tomatoes, powdered cumin seeds, oregano, vinegar, and sometimes other ingredients. Black beans are high in folate (256mcg), iron (3.61mg), magnesium (120mg), and phosphorus (241mg); they are also a source of zinc (1.92mg), niacin (2mg), and thiamine (0.42mg) - based on 1 cup portion size.